Hello. I am Uncle D. I'm glad you stopped by my web site. My speciality is fruit. I have been growing fruit as a hobby or business for many, many years. My wife (Aunt Rosie) and I moved to Tennesee in 2006. I started planting fruit trees in 2007 and I haven't stopped yet. I enjoy growing fruit trees but I do grow other kinds of fruit. Currently I have green seedless grapes and two varieties of gooseberries. Check out Uncle D's Fruit to see what kind of fruit I am growing. Not all of them are producing yet but each year they may start. Aunt Rosie has her own speciality. She grows herbs, flowers and other kinds of plants. She harvests these items and dries them. Then she combines these items in different amounts to create...Aunt Rosie's Herbs & Blossoms! Click on Aunt Rosie's Pages to see her section of this web site. A new apple in the "crisp" family. This is a cross between an old reliable and well known apple, Golden Delicious. It is crossed with an apple from England from the 1800s. Cox's Orange Pippin. It has won tasting contests almost continuously in England. This gives Suncrisp an extremely delicious flavor and is a crisp apple. Ripens around the end of September till early October. Unique, flat peaches shaped like a donut. These are white fleshed peaches that are very sweet. The smaller size makes them a special treat for children when a full size peach is too big and messy for them. It is very easy to remove the pit. Just break the peach in half and pop the "pit" out. They ripen early till middle July. One of many new "kinds" of fruit. 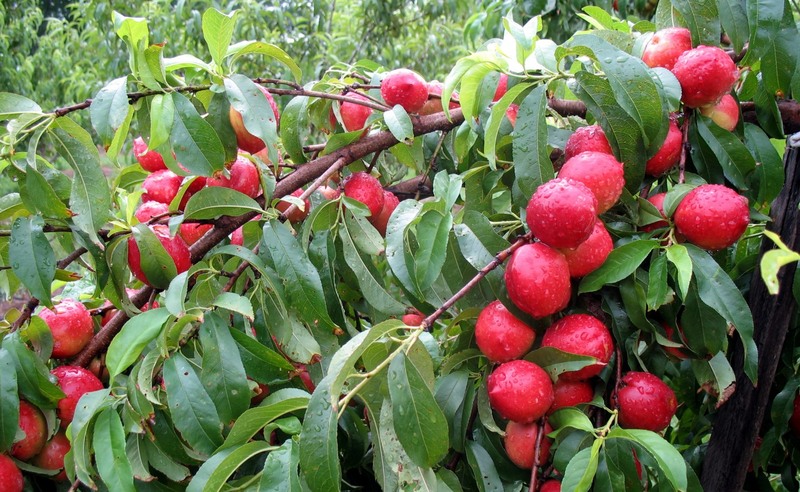 A pluot is 75% plum and 25% apricot. Flavor Grenade is very sweet and different for a fruit item. It is very crisp and snaps when you bite into it. Because the flavor "explodes in your mouth" when you eat it, it is called - Flavor Grenade! They ripen around the end of August into September. The Aromatnaya quince is an unusual quince that is sweet enough to eat fresh. Pineapple flavor with a citrus aroma, this beautiful large quince is picked in October and softens to a pear-like texture after harvest. Aromatnaya quince is excellent for cooking, jelly making, or adding to apple cider. 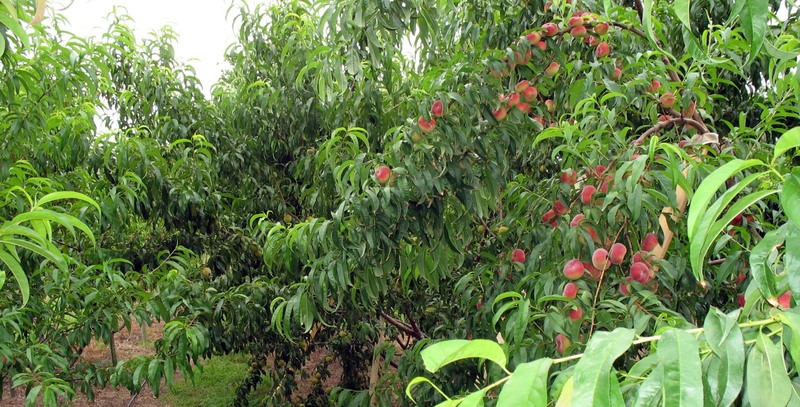 They ripen late Sept. till early Oct.
Another flat, donut peach but looks like a bagel. This is a yellow fleshed peach but is larger than Saturn donut peach. 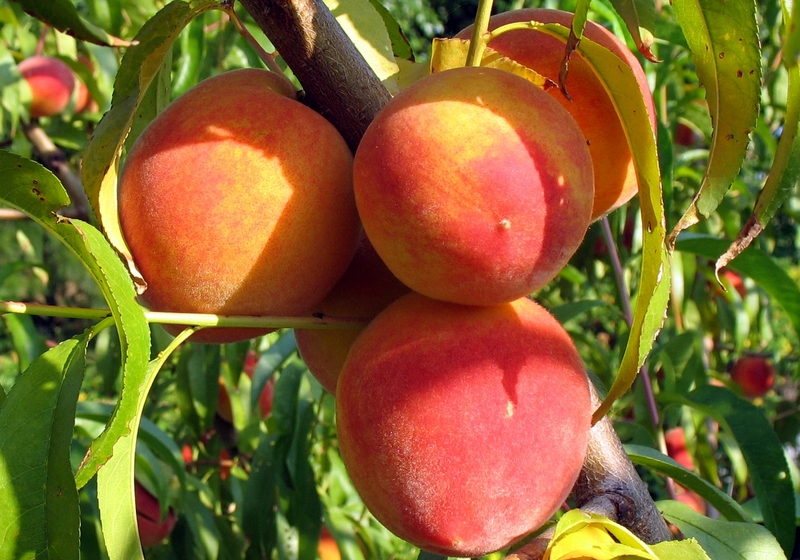 A sweet, delicious peach with lots of flavor. More of an adult size peach. Ripens in August. Seedless, medium sized green grapes high in acid and very sweet. It has fruit of excellent flavor and quality. Fruit is good for fresh eating and makes excellent raisins. Ripens late Aug. till early Sept.